(first posted 5/21/2017. And I forgot then to credit the Cohort poster; my apologies) It’s time for a little balance to all these big Amerkaner Strassenkreuzer. 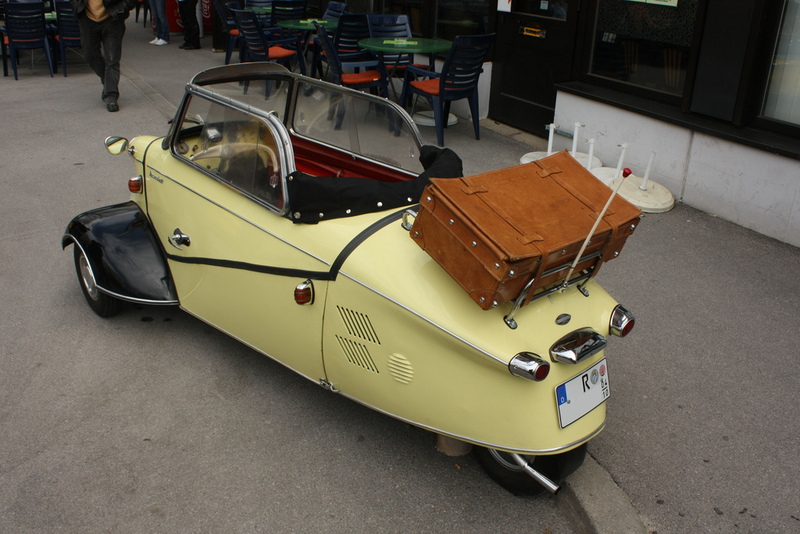 And what could be a better antidote than a Messerschmitt? Along with the BMW Isetta, they have become icons of the micro-car era in Europe, when the post-war yen to hit the road in anything that had wheels and an engine – no matter how small – was so powerful. 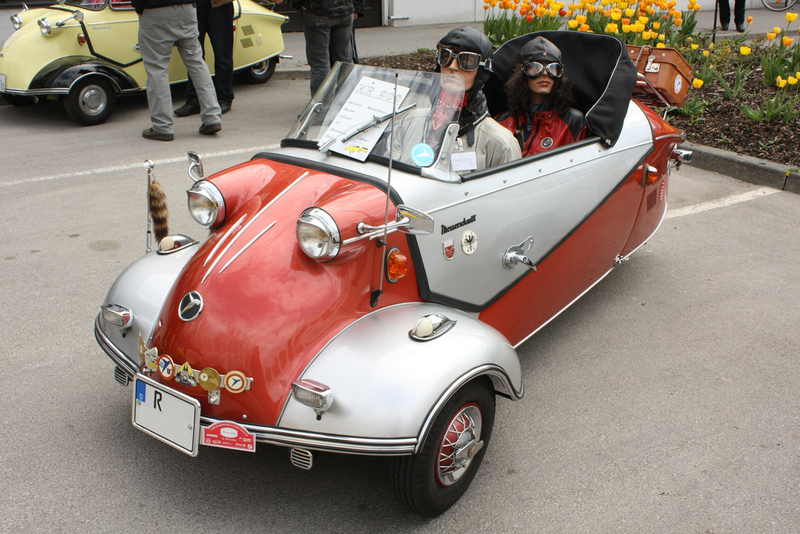 The result was a raft of tiny cars, but the Messerschmitt stands out for both its unique tandem seating (1+1), its airplane-style bubble canopy (not leftover ww2 Messerschmitt fighter units, as some have suggested), and for the (relatively) high-performance Tg 500 version. R0b0tr10t shot these, obviously at a car show in Germany. 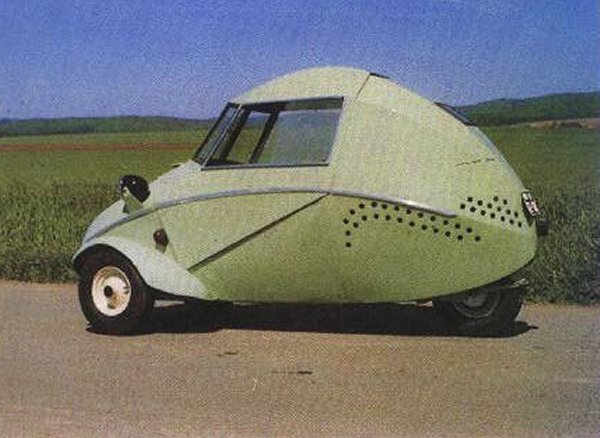 The Messerschmitt Kabinenroller has an interesting story (like so many new postwar cars in Europe). It started out as the Fend Flitzer, an invalid carriage initially powered by “rowing” the handlebars back and forth. Soon, a 38cc two-stroke was added. 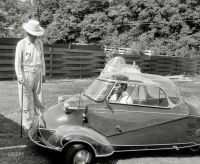 Fend then designed a larger, enclosed car (above), with a larger 98 cc F&S two stroke. About 250 were made, and he sought out a larger manufacturer to increase volume. That led him to Messerschmitt, which was banned from building airplanes in the immediate postwar era. 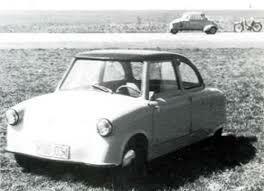 The vehicle was drastically redesigned, and went into production in 1953 as the Messerschmitt KR 175. The “KR” stands for Kabinenroller, which means scooter with cabin. In 1956, the substantially improved KR 200 arrived. Its 200cc Fichtel & Sachs two stroke now made 10hp, which gave the KR 200 an alleged top speed of 90 km/h (56 mph). It was a success, and about 12,000 were sold in the first year. 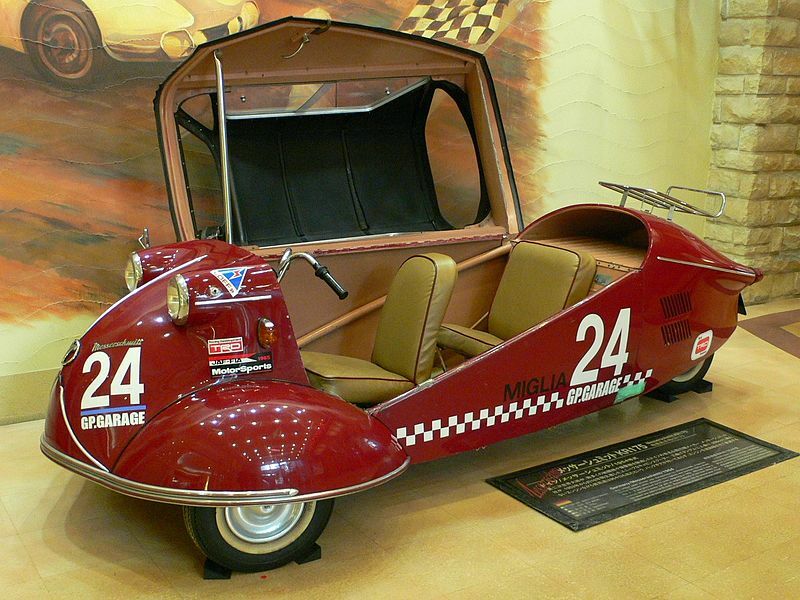 In addition to the bubble-top, there was also a Kabrio, with folding top, which both of these examples represent. 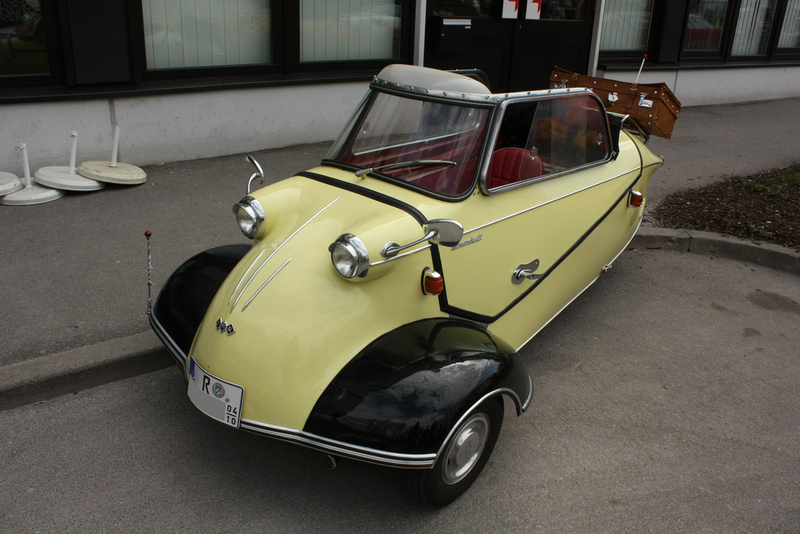 In the same year (1956), Messerschmitt was allowed to go back into airplane production, so the Kabinenroller was taken over by FMR, but the Messerschmitt name was continued to be used. The KR’s low center of gravity gave it very good handling. The engine was designed to run forwards and backwards, which meant that it needed no separate reverse gear, as it could use all four of the gears in the sequentially shifted transmission running backwards! The ultimate evolution of the design was the four-wheeled FMR Tg500. It sported a 500cc F&S two-cylinder two-stroke, which gave it much improved performance. Top speed was now 78 mph, and the Tg (commonly called “Tiger”) even found itself on the racetrack. But its high price – about the same as an Austin Healey Sprite – doomed it to a small production run; less than 1000 were built between 1958 and 1961). The KR 200 soldiered along until 1964, by which time rising incomes in Germany made it irrelevant. My home town has been long noted for its music school, and for some of the out-sized personalities employed there. 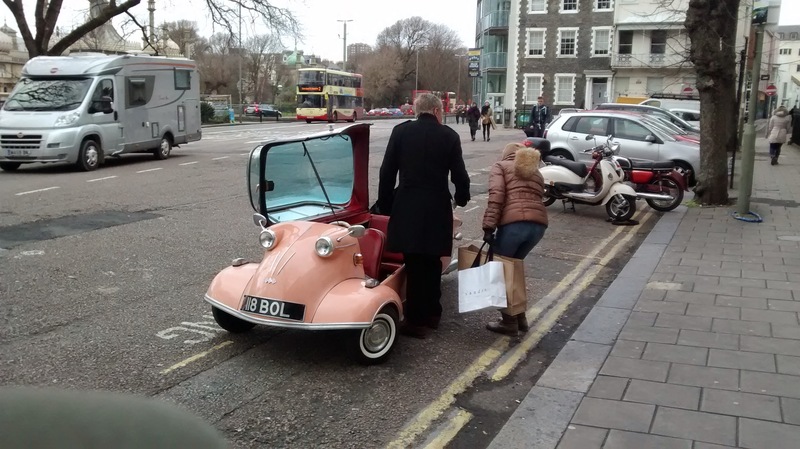 One was an opera conductor who drove a Messerschmitt, bright orange as I recall. Several of these cars can be seen in Terry Gilliam’s movie, “Brazil,” including one set fire by delinquent grade schoolers. 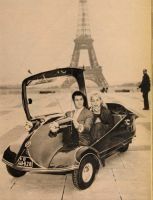 And a final pop culture note, though better known for pink Cadillacs, Elvis owned a Messerschmitt! I’d like to see something like this with a fourth wheel and styled like a 60’s-70’s domestic vehicle. Bug eyes just burn my retinas…on tractors and especially cars. I wish I had the skills to fabricate one since I have such fantastic access to all things mechanical. I’ve often wondered if, had the Tiger sold well enough to get some volume the next evolution would bring it a “real-car” body, either a side-by-side open two seater in its’ sports car form or a four-seat 2 door sedan. Corvair-inspired, of course. For the longest time, I thought the KRs were actually built from leftover WWII Messerschmitt airplane parts! 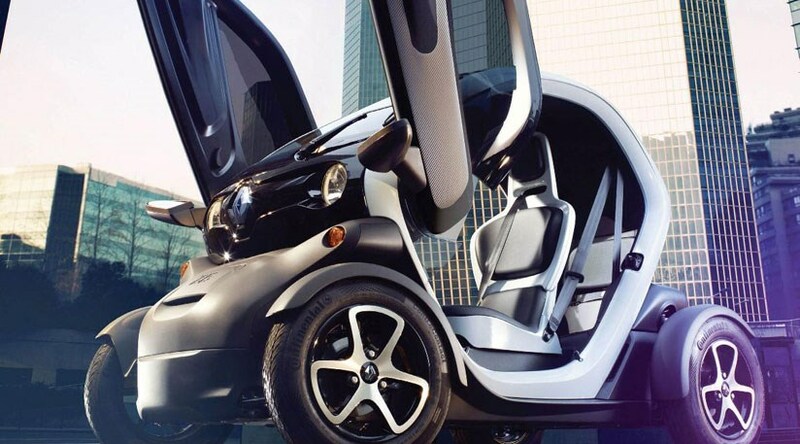 The “enclosed scooter” idea is like a sensible midpoint between Segway and Smart Car. One needs to get bigger and weatherproof, the other smaller and lighter. If it was possible to take one to work in the winter without freezing your Flitzers off, what if? Good story Paul Ive never seen the enclosed version or ever heard of it, Thanx. For those interested, the museum in in Amerang, in Bavaria. From Munich, go east to Wasserburg am Inn, and go south. Further south you hit the resort area of the Cheimsee. Serious gearheads might want to visit the Deutsches museum in Munich. One of the best science and technology museums you could hope to find. I would also highly recommend it. Turns out Elvis was quite eclectic. He also owned an Isetta! Nice write-up of the Isetta history at http://codex99.com/design/96.html, capped by a photo of the Elvisetta. Elvis had all sorts of crazy stuff, he’s best known for Cadillacs, but he had Panteras, Stutzes, Jeeps, Mercedes-Benz, Isettas, etc etc. A modern version of something like this would be an interesting middle ground between scooters and Smart cars. I wonder if these were an inspiration behind the Can-Am Spyder? 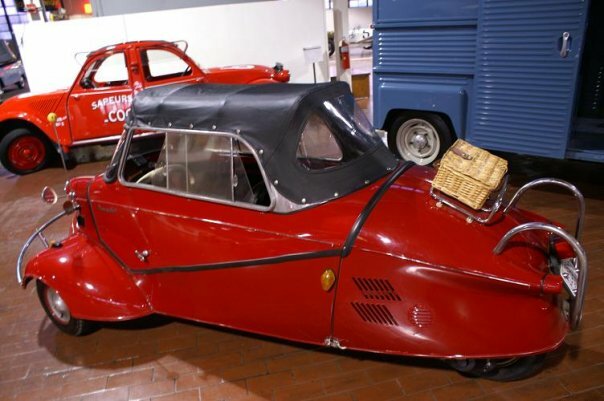 Où puis-je trouver la Messerschmitt KR 500? Here in Arkansas we get occasional news about the Elio. It is a startup effort just over the state line in the old Shreveport GM plant. 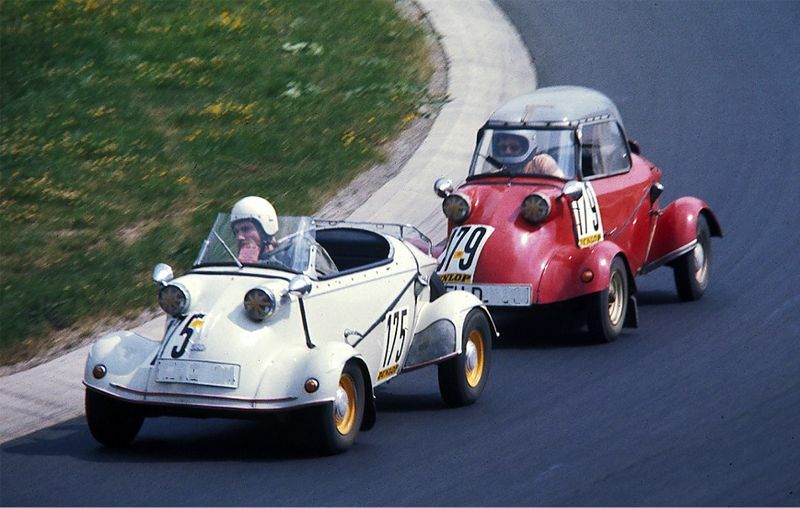 I’ve seen plenty of photos of these 50’s micro cars in the past, but never put the two together. This recycled post happened to hit my inbox within 24 hours of something from Elio. It suddenly hit me how close the concepts are. Judge for yourself. This would REALLY look cool with a Republic Thunderbolt P 47 style bubble canopy. When I happened across a KR200 on the street a few years ago, I was struck by just how tiny it really is — it didn’t look like even one person could fit inside, let alone 2! The whole car is only about 9 feet long and has a curb weight of just 507 pounds — that’s less than most Harley-Davidson motorcycles. I sure wouldn’t want to drive one in traffic today. But things were very different then. Especially in Germany – can any of us (Paul excepted) really imagine what life must’ve been like back then, for one of these to be viable everyday transport? These vehicles are very similar in concept to cycle cars which were sort of popular in America the 1920s. They were always kind of crude and they weren’t that cheap. Henry Ford drove down the price of his Model T until it was as low as most cycle cars. And the T was a real, honest to God full size automobile. The story is the same as incomes rose, interest in tiny cars disappeared. THANK YOU Paul ! . What a great article . I remember the occasional Messerschmitt (? SP ?) in the 1970’s, a beautifully restored firecracker red one in Hollywood (where else ?) 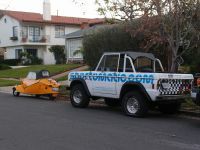 and two in Altadena, Ca., one was really scruffy and missing parts of the Plexiglass cover but still out and about driving, sounding like a vintage Jacobson two smoke lawn mower as they puttered past . 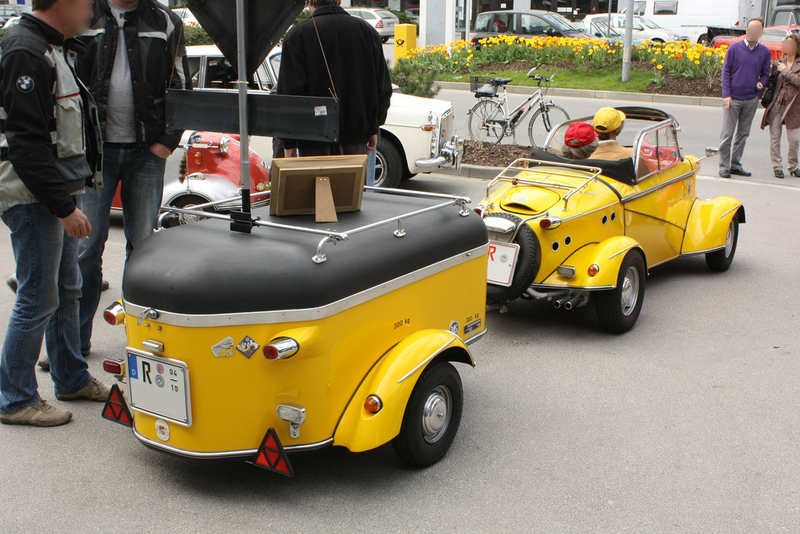 The annual Micro Car Show always has one or two of these cute little buzz bombs . Great article. I don’t think I’ve ever seen one in the metal. While digging around on the net for more pictures, I ran across this car. It appears that Messerschmitt had ideas for a more normal sedan (called the P511) but with a rear-mounted five-cylinder radial engine. A smaller version was toyed with too. That looks like a Goggomobile. That thing looks like a macaque. I came across one of these in Brighton a couple of years ago. I was impressed with the carrying capacity – it had two people, a medium-sized dog and a fair amount of shopping. I had a KR 200 in 1968. In the UK you could drive a 3 wheeler if it did not have a reverse gear at the age of 16, normal age for a licence for a car was/is 17. The Messerschmitt had a two stroke engine that was started in the opposite rotational direction ( press the ignition key further in and start as normal ) to provide a means of going backwards and meant all 4 gears could in theory be used. Never could find out if I was driving legally or not. The KR200 had a rudimentary heater piping hot air from the engine. I am 6′ 3” and fitted comfortably into the bubble, the seat had a pantograph system that enabled it to pul up and back to allow you to get in more easily. The rear passenger sat with their legs astride the front seat, not as uncomfortable as it sounds. I had an Uncle who used to drive from Lincoln in England to just south of Glasgow Scotland frequently in one , about 329 miles.